Noon or 3:30 games in the South during the early parts of football season are brutal. The sun is intense and most stadiums offer little in the way of shade. Within minutes, you are sweating and dying of thirst. Lines are long for water, and when you finally get a $5 (or more) bottle of water, it is lukewarm and hard to drink. The water fountains don’t offer any better alternatives. Stay cool with our top tips to stay cool during early season tailgating and games. Disclosure: This post contains affiliate links for all the RV Gadgets below. You get the same low prices and we earn a small commission to help us buy more RV tailgating gadgets. Or game tickets if you go on a shopping spree. 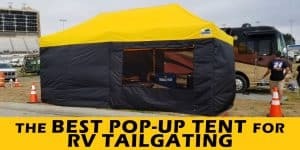 RV awnings and pop-up tents are the #1 way to stay cool and survive the tailgate. There really is no getting around it. If you don’t have one already, get a team pop-up tent. You can use it at the neighborhood pool or in your backyard until tailgate season, but you need this before you hit the blacktop. If you have the choice, pick a shady spot to park the RV. 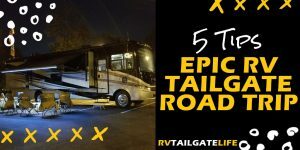 One of the great things about RV tailgating is electrical power for your tailgate! Roll out that extension cord and hook up a box fan to help circulate the air. I have a fan similar to this Lasko fan available from Amazon – it has a handy remote control so you don’t even have to get up from your tailgating chair to turn it up. In the first RV (Starter RV), I stored the fan attached to the dog crate in the RV with a bungee cord. Now, I just put it in the pass-through basement storage area. Ever seen those cool zones at a stadium or perhaps the misting fans on the sidelines? Create your own at the tailgate! One of my fellow RV tailgaters has an Artic Cover mister that runs on an 18-volt battery (the kind that fits your cordless power drill and other tools in your garage). If you are willing to spend a little more money, you can setup a Canopy Cool system that creates a mist zone through the entire pop-up tent or the length of your awning. Some fans have misting systems built-in (if you are buying a new fan, I recommend this feature). Take one of the portable mister fans with you for the game itself. 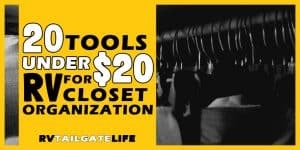 Georgia Tech made a change a few years ago to let season ticket holders bring food and non-alcoholic drinks in the stadium with a special clear season ticket holders bag. We made it even better by freezing the water bottles (careful if you try this with Coke bottles!). By about halftime, the ice has melted enough to drink ice cold water. Meanwhile, you won’t be paying $5 for a lukewarm bottle of water at the stadium. RV tailgaters have an advantage with the built-in freezer – you can take the frozen water bottles out just as you are leaving for the game, instead of letting them melt in the cooler. I’ve even been known to put koozies on the bottles to help them stay cold just that little bit longer. Check the rules for the stadium to see if you are allowed to bring in outside drinks. NFL stadiums will not let you do this. Only the lucky college stadiums permit it. Even if you can’t take water into the game with you, make sure that you stay properly hydrated. And yes, that means also keeping the alcohol to a minimum. Stick to beer instead of liquor at least. 2018 Update: Georgia Tech and other college stadiums have gone away from letting you bring in water or other liquids. Some let us bring in empty water bottles and fill them up at water filling stations inside the stadium. The water in these filling stations has been much colder than the typical water fountain water – and is free. One of the RV Gadgets we recommend is a portable ice machine! Great to make sure you never run out of ice on a hot day! These cooling towels are awesome – put a little water on them and they help absorb the sweat, lowering your body temperature and making life a little more bearable. Cooling towels are probably the only reason I survived Georgia Tech-Tulane in September 2014, when there was not a cloud in the sky, the temperature was about 105 degrees and the heat index was off the charts. These towels are machine washable so you don’t have to worry about germs growing on them between games. Loose, lightweight cotton is better than heavier materials like wool. Long sleeves sometimes can be useful to keep the sun off your skin and not get sunburned. Flip flops and sandals are better than tennis shoes too. There’s also a reason that the frat boys love visors – they are cooler than ballcaps. So, take after the Old Ball Coach to stay cool and you’ll even have something handy to throw when the ref makes a bad call against your team! Another great (and highly underrated) benefit of RV tailgating is the ability to take a shower and keep on tailgating. After that hot sunny game, you can come back to the tailgate, take a shower (you won’t even need to turn on the hot water heater) and then put on clean and dry clothes. Cool off and get the grime off: two birds, one shower! If you have enough water or access to a water supply other than your RV, then consider a kiddie pool – let the little ones splish splash through the tailgate and you can even dip your feet in. Keeping your feet cool will help your whole body feel cooler. Just don’t forget to bring an inflator – you don’t want to spend all your “hot air” blowing the pool up. Many of the tire inflators will have adapters for pool floats, so you may already have one on hand. No, I don’t mean the food on the grill. But if you bring your dogs to the tailgate, then you need to keep an extra eye on them during hot tailgates. We all love them, but dogs are more vulnerable to heat. Make sure they are well hydrated and have plenty of shade. Also consider a chilling pad for them to sit on outside or in the crate. They are pressure-activated, with no need to freeze or chill them. They provide a bit of cushion and are easy to clean. Burdell has one that we keep in the crate at all times. Try these Homemade Frozen Dog Treats to keep your puppy comfortable during hot tailgates! If all else fails, enjoy the benefits of air conditioning in your RV. Sometimes, you’ll just have to run the generator to stay cool. Keep the RV cooler by grilling outdoors and not using the stove, oven or microwave inside the rig. How do you stay cool? Share you tips by commenting below!